While I was at the beach, I managed to read three different books by the psychic Sylvia Browne. Yes, I'll admit I love her and her ideas about spirituality and the afterlife... Not that I totally buy all of it. Anyway, in one of her books, she discussed the end-of-life review, where people learn from their lives on Earth. She wrote about how it's possible to "flag" a moment in time, for further review, or because it is one of those moments that made you exquisitely happy. She explained that she and her family now tell each other "flag that" whenever such a moment occurs, so it will not go unremarked. 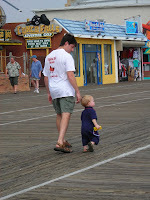 Sam is walking so confidently now. It is wonderful to see him go after whatever he sets his mind on. In this case, it was a seagull. 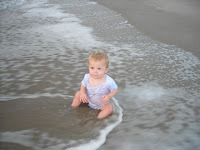 Sam was a little unsure about the ocean at first. 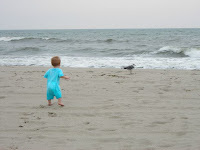 By the end of the week, he was running to meet the waves, digging in his feet, and grinning when the waves reached him. 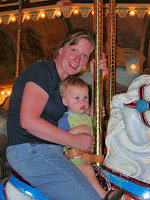 His first carousel ride was with Tom. 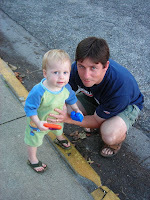 He seemed a little apprehensive and wouldn't look at us waving at him. On this ride, he was more confident... so much so that he fell asleep in my arms by the time the ride was over.